More than 25 years ago, Stephen Sondheim’s musical about fairy tales opened on Broadway. The musical brings together the familiar tales of Little Red Riding Hood, Jack and the Beanstalk, Cinderella, and Rapunzel with an original story of a Baker and his Wife. The Baker’s Father has been cursed by a Witch, and they are unable to have children. The Witch comes to the couple and tells them the curse will be reversed if they bring her what she asks. So all the characters venture “Into the Woods” to do what they need to do. Sondheim’s musical begins on a light, witty note, with the familiar stories intersecting with one another. At the end of the first act, it looks like they all got what they wanted, and will live happily ever after. But Act II lets us know that there is no “happily ever after,” at least not in the way we expect. 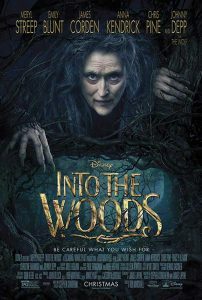 I loved “Into the Woods” on stage, with its wonderful score and story line that gets darker before turning around. I was unexpectedly moved by the depth of the story. Although we lose people in the woods, we are comforted by the haunting song “You Are Not Alone.” In order to get through the challenges of the woods, we are given companions with whom we form community. I don’t think “Into the Woods” works as well on film. Even though the main elements are still present, it all seems a bit flat. The characters keep running into each other in a wooded area that seems small and not very frightening. I accept the physical limitations of the stage, but with all the special effects we see in films today, the action of “Into the Woods” seems contrived. Rob Marshall has had success directing both stage and film musicals (the dazzling “Chicago” being the gold standard.) His direction of “Into the Woods” doesn’t find the right pace or tone. When the story gets darker, the movie begins to drag a bit. Even the memorable Sondheim score is not put to good use. Perhaps that’s because Marshall didn’t have faith that the actors could carry off the challenging score. Meryl Streep has a great time playing the witch. Amazingly, she sings well. Is there anything she can’t do? Despite my criticism, there’s enough good to make “Into the Woods” worth seeing, especially for those who have not seen a good stage production. It reminds us of the need to tell the stories our parents told us to a new generation. And don’t leave out the scary parts. Even though they might not understand when they are young, children will listen, and learn.